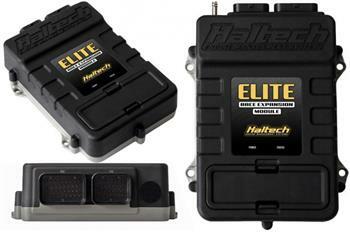 Haltech ECU - Elite Race Expansion Module (REM) UNIVERSAL - MiataRoadster - Stay tuned with MiataRoadster! The Race Expansion Module (REM) is used in conjunction with the Haltech Elite 2500 ECU to offer extra Input and Output functionally as well as Advanced Torque Management. Using the REM with the Elite 2500 allows sequential staged injection of up to 16 injectors, and will drive up to 32 injectors. The REM also has additional Analogue and Digital inputs which can be used for data acquisition as well as additional Digital outputs. Aimed at drag racing professionals, the Elite Race Expansion Module (REM) with Advanced Torque Management is Haltech’s brand new engine management feature that promises to reduce the loss of traction and tyre shake, making aborted passes a thing of the past. Haltech’s Advanced Torque Management eliminates the impact numerous variables like the surface condition or temperature can have on the car’s performance providing consistent, repeatable results. A Driveshaft RPM sensor monitors the Driveshaft RPM and reports back to the ECU. The Driveshaft RPM is then used as a target in the Torque Management tables. If the Driveshaft RPM goes above or below the target Driveshaft RPM, the ECU immediately adjusts the tune to compensate and bring the Driveshaft RPM back to its pre-set target. As well as Driveshaft RPM, Haltech’s Advanced Torque Management can also be mapped against Wheel Speed or Engine RPM. Multiple profiles can be set up and triggered by a sensor input or a dashboard switch panel. How does it help you go faster? The benefits of having full control over your torque are many and varied, the most obvious one being consistency. Changing track conditions, temperature or environmental factors can all cause loss of traction often resulting in aborted runs. With Haltech’s Advanced Torque Management every run counts and every run delivers consistent results. If there is one thing all seasoned drag racing pros agree on it’s that consistency equals lower ETs.